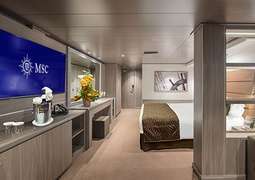 MSC Seaside is one of the Seaside-class ships and is a modern state of the art cruise ship, offering cruises to the Caribbean and the Bahamas. ‘The Ship that Follows the Sun’ is the concept of the MSC Seaside, which cruises to the Caribbean from Miami and Orlando year-round. The ship truly captures the concept of a cruise vacation with sprawling alfresco areas and a seafront promenade filled with boutiques and restaurants. There are endless adventures awaiting families with children of all ages on board the MSC Seaside, from the baby club to the teens club and the aqua park to a thrilling high ropes course. 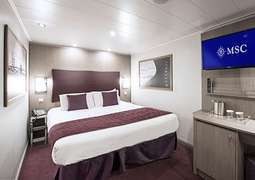 The on-board leisure facilities are as individual as you, with interactive waterslides, stage spectaculars and pulsing on board nightlife to enjoy. Indulge in a rejuvenating luxurious wellness treatment at the Bali-inspired Aurea Spa, the perfect place to relax, unwind and recharge your batteries. ‘The Ship that Follows the Sun’ is the concept of the MSC Seaside, which cruises to the Caribbean from Miami and Orlando year-round. The ship truly captures the concept of a cruise vacation with sprawling alfresco areas and a seafront promenade filled with boutiques and restaurants. There are endless adventures awaiting families with children of all ages on board the MSC Seaside, from the baby club to the teens club and the aqua park to a thrilling high ropes course. The onboard leisure facilities are as individual as you, with interactive waterslides, stage spectaculars and pulsing on board nightlife to enjoy. Indulge in a rejuvenating luxurious wellness treatment at the Bali-inspired Aurea Spa, the perfect place to relax, unwind and recharge your batteries. The highly-anticipated MSC Seaside is the fleet’s most spectacular new addition. 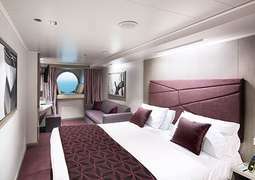 ‘The ship that follows the sun’ offers a variety of modern and elegant stateroom types, from cozy Interior staterooms to Oceanview and Balcony staterooms and luxury Suites. 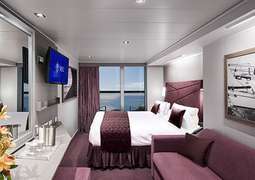 Special needs staterooms are also available. A world of culinary discovery awaits you on board the MSC Seaside, with a stunningly diverse range of dining options, bars, and nightlife available. Connoisseurs have the opportunity experience the Asian Market Kitchen by award-winning chef Roy Yamaguchi. Families can expect an enjoyable dining experience with the dedicated family buffet on deck 16, which provides a variety of popular dishes the whole family will love. A wide range of entertainment and activities provide endless fun on board the MSC Seaside. Interactive waterslides, one of the world’s largest at-sea water parks and the world’s first 360° Waterfront Boardwalk make daytime activities fun for the whole family. In the evening, a great range of bars, lounges, and stage shows create a lively on-board nightlife. A wide selection of sports facilities and state-of-the-art fitness center with fantastic sea views provide a unique opportunity to keep active. The Bali-inspired MSC Aurea Spa provides luxurious spa treatments to revitalize the mind, body, and soul. Throughout your cruise on board the MSC Seaside, we recommend sporty casual clothing, with a cocktail wear for ladies and suits for men for special evening occasions. MSC Seaside is designed specifically for the warm weather and year-round round-trip Caribbean cruises from Miami. An eco-friendly vessel accommodates guests of all ages with a great variety of onboard activities and amenities. MSC Seaside’s cutting-edge technology combined with her luxurious features have produced a floating paradise of MSC Cruises. MSC Seaside is specifically designed for warm climates and offers endless fun for the whole family, with a full-sized bowling alley, multi-story water park and a stunning high-tech theatre to enjoy spectacular Broadway-style shows. There is also a vast array of spa facilities at the MSC Aurea Spa. Pamper yourself with luxurious Balinese massages, thalassotherapy, advanced beauty treatments and a Turkish bath, while kids and teens enjoy fabulous clubs of their own. Parents will be delighted with a special area exclusively dedicated to children – cheerful and colorful. Dinner is served! If you enjoy fine cuisines as well as casual dining, MSC Seaside would be your top choice. Elegant dining with breath-taking sea views is a magnificent experience, from the hand-picked décor to the attentive table service that will take you to a whole new level. Allow master chefs to satisfy the most stubborn taste buds and prepare to be delighted. Nine amazing eateries serve a mouth-watering blend of freshly prepared international specialties on the Seaside. This amazing restaurant offers an assorted Mediterranean menu, including light dishes and options that are always available.